If you haven't jumped on the velvet train yet, you're missing out! Not only is it super cozy, this fun fabric just spices up any outfit. I've recently been drawn towards everything velvet, off-the-shoulder, bell sleeve and block heel. I currently work in the corporate world, but with a business casual dress code. The struggle is SO real for me every day getting dressed because I never know what's too dressy and what's too casual - though I am never one that's against being overdressed. Mainly, it largely is a struggle as all I want to purchase out in the stores right now are items and trends that may not be deemed work appropriate. But, being able to utilize these trends in a smart way makes it possible to sport the style and be within guidelines. 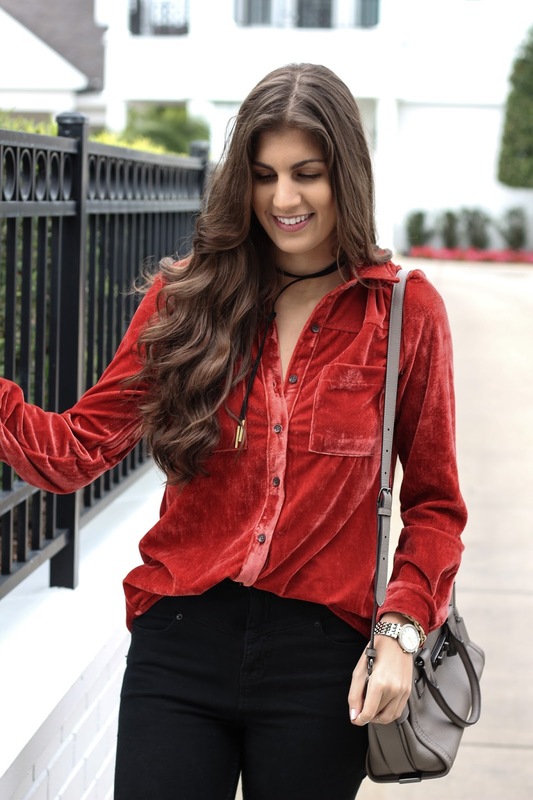 This velvet top, for example, is the best of both worlds (and less than $25)! It's super comfortable, and it's appropriate to be worn in the workplace. Truthfully, I love pairing this top with some leather pants and heels for date night, too! Ironically, I had this conversation with some of my co-workers yesterday about how hard it is to shop right now for our dress code. We're all tempted by the current trends, but would have to take specific measures to be able to sport them to the office - there'd have to be some appropriate layering. This weekend I've decided to go on a mission to the mall with one thing in mind: buy new clothes (I just recently cleaned out my entire closet) that are on-trend and appropriate for work. I'll be sure to report back about how it goes! Does anybody else have this struggle? 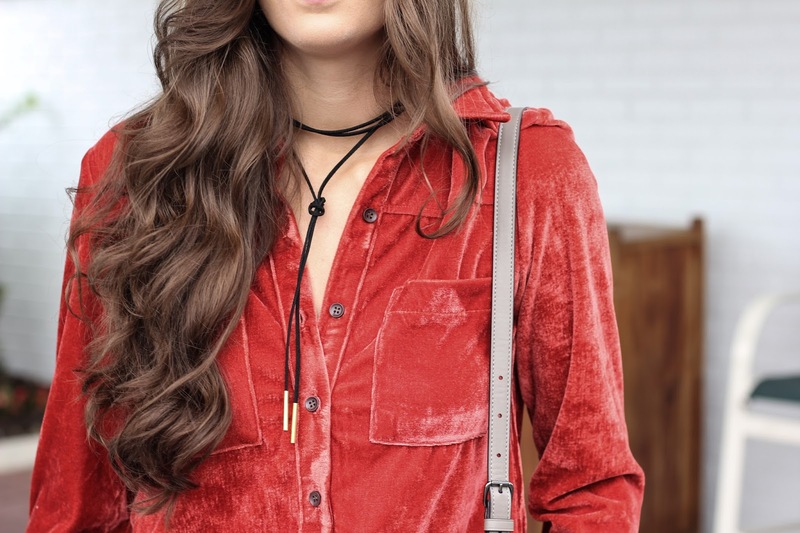 ooh i haven't seen a velvet top like this -so pretty and fun! 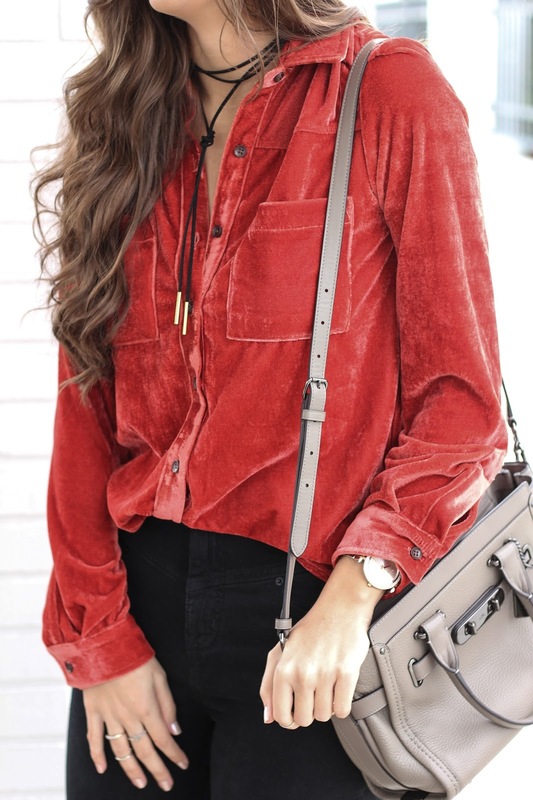 Love this velvet top! I have a very similar choker to the one that you are wearing. 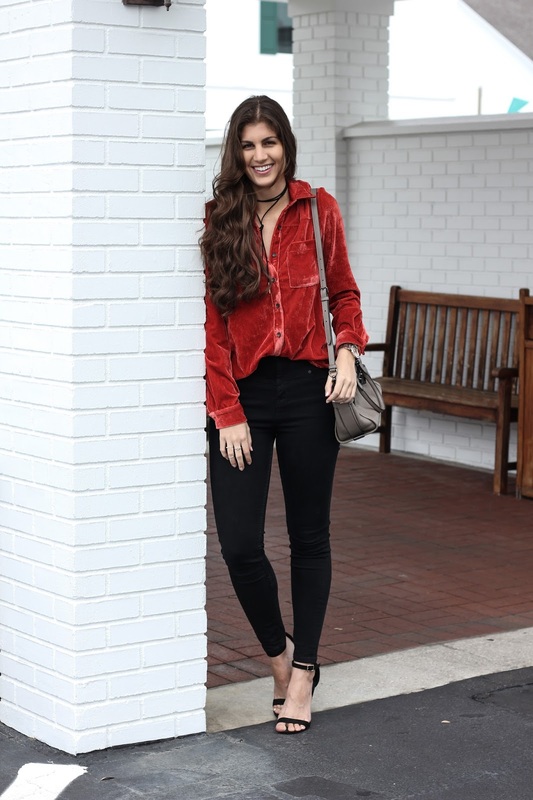 This velvet top is gorgeous and such a great deal!! Love how you styled it girl! Love your velvet top, and that choker is so cute!! Great color on you!! 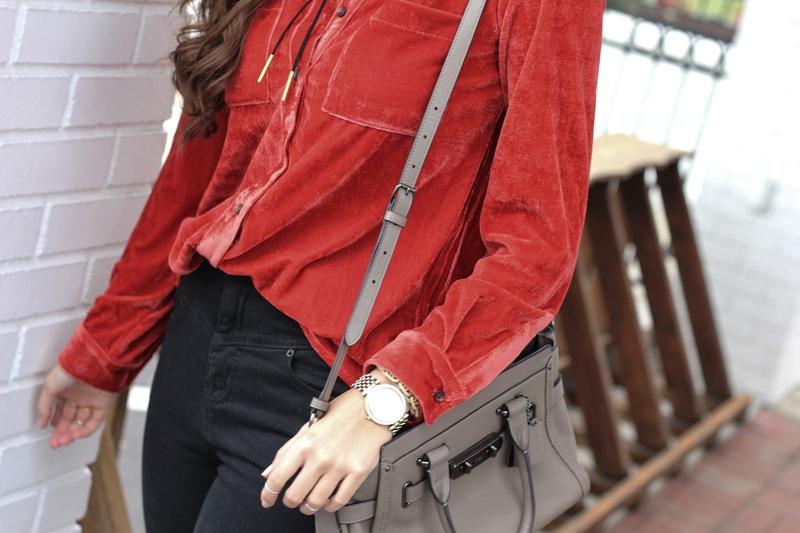 I LOVE this velvet top. So funny, I was just thinking about a similar one I had from the Gap in the 90s! I love it paired with the choker. Perfection!